A. Designation. By ordinance or resolution, the City Council may, in its sole discretion, designate a residential targeted area. As required by RCW 84.14.040, adoption of a resolution designating a residential targeted area shall follow a public hearing noticed once each week for two (2) consecutive weeks in a newspaper with general circulation within the City, not less than seven (7) nor more than thirty (30) days before the date of the hearing. b. Stimulate the construction of new multifamily housing and the rehabilitation of existing vacant and underutilized buildings for multifamily housing that will increase and improve residential opportunities within the City’s urban centers. C. Other Factors. In designating the residential targeted area, the City Council may also consider other factors, including, but not limited to, whether additional housing in the targeted area will attract and maintain a significant increase in the number of permanent residents, whether additional housing in the targeted area will help revitalize the City’s urban center, whether an increased residential population will help improve the targeted area and whether an increased residential population in the targeted area will help to achieve the planning goals mandated by the Growth Management Act under RCW 36.70A.020. D. Portion of Lot in Designated Area. If any portion of a lot is within a residential targeted area, the entire lot shall be deemed to lie within the residential targeted area. E. Amending or Rescinding Designation. At any time the City Council may, by ordinance or resolution, in its sole discretion, amend or rescind the designation of a residential targeted area pursuant to the same procedural requirements as set forth in this chapter for the original designation. 1. 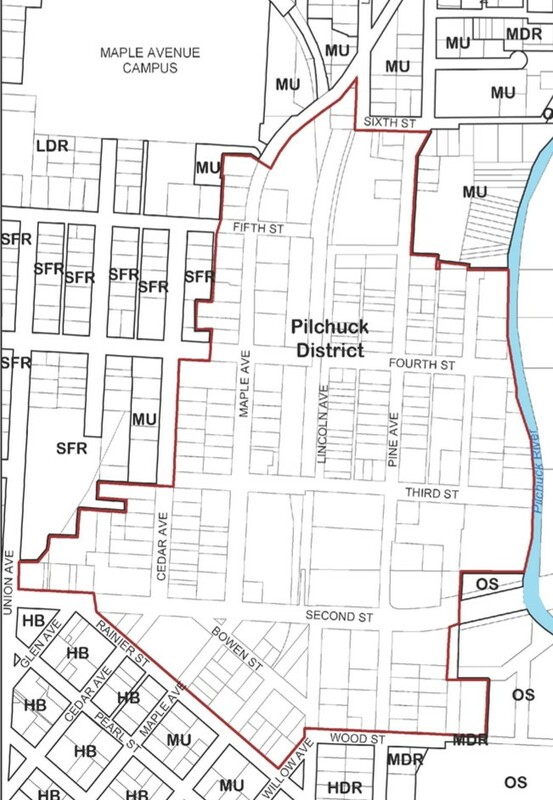 Pilchuck District Land Use Designation Area.